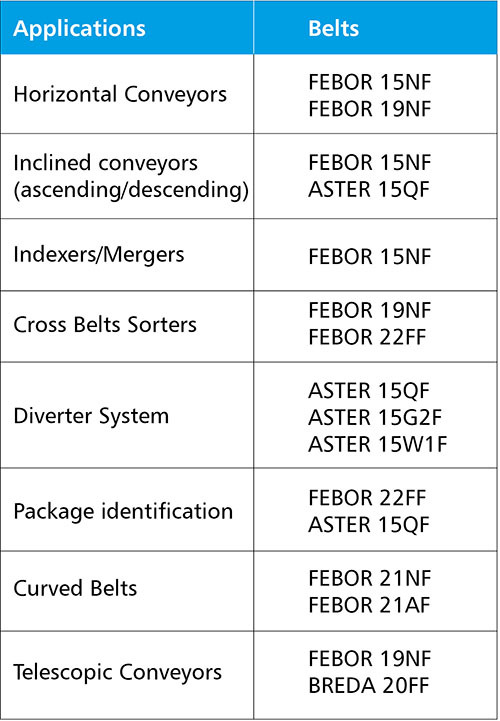 Our standard range of belts offers several options for each type of application. The FEBOR and ASTER series for logistics and distribution centers easily meet the needs of the sector, compliant with the requirements for handling, conveying and classifying goods. The high quality and reliability of our belts translate into optimum performance, proven by numerous companies in the sector. Get optimum results in all sections of distribution and logistics centres. Flame retardant, antistatic, silent fabric. Several options available for each type of application.